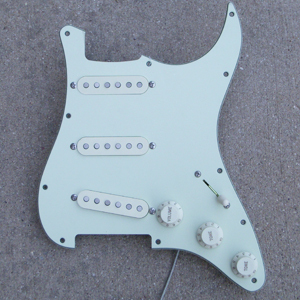 Looking for the Scooped Mids Stratocaster Tone in a Loaded Pickguard? -Other options: +$24.00 Shielding, +$20.00 Pearloids, +$10.00 No Load or Blender Wiring, +$77.00 Authentic Fender 4-PLY Tortoise Pickguard. * ADD ITEM TO SHOPPING CART THEN SPECIFY PICKGUARD COLOR CHOICE & 3 or 5-way SWITCH. -We Only Ship Loaded Pickguards EMS To International Customers. We Will Not Ship Them Any Other Way.